From the moment Dan Shipper stepped foot on the University of Pennsylvania’s campus, he knew he wanted to learn how to build a real software business with paying customers and steady revenue. He passed with flying colors last month when he both graduated from school and sold his company Firefly (the first company backed by Dorm Room Fund) to Pegasystems for multiple millions. Shipper’s success didn’t take anyone by surprise. Targeted early as a technology wunderkind, he was receiving multiple job offers by his sophomore year. He chose to stay in school, he says, because he wasn’t done learning. Now, having seen his first company through an exit, he has a degree and perspective on what makes a real difference for young companies and entrepreneurs. In this exclusive First Round Review interview, Shipper shares the three tactics that moved the needle the most for him and Firefly, and how beginning founders can get a head start on success. In its first 10 months, Firefly brought in $11,000 in revenue — total. 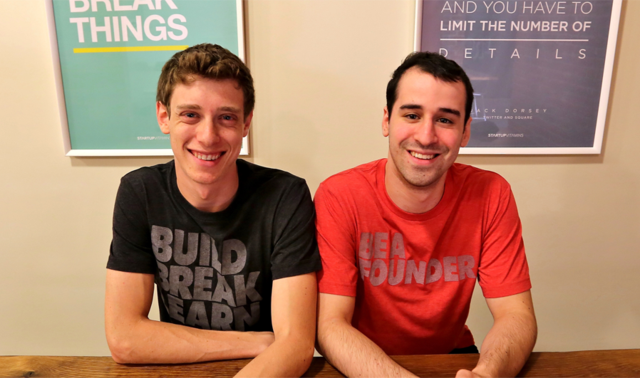 While Shipper and his co-founder Justin Meltzer (pictured above, right) were sure the company solved a concrete problem — allowing two people to collaboratively browse the same webpage without any special software — sales weren’t promising. It would have been a valid decision to throw in the towel at that point, he says. For Firefly, Shipper and Meltzer made a big push to learn everything they could about the customer support industry — which they decided was the primary audience for their product. The key was to look at the last 10 months, and determine whether they needed to shift course based on the results. In their case, they stayed on the same path while making only small modifications to their approach. This allowed them to close big deals that paid off in the long run. A lot of entrepreneurs cite relentlessness as a good quality to have. You want to be relentless about finding product market fit. You want to be relentless about building your product. There’s this idea that to succeed you can’t let up — you have to be driving hard toward your goal at all times. While Shipper agrees that this energy can be productive, it’s easy to be relentless about the wrong things. Acting scrappy also makes you humble, and humility is sometimes the best sales tactic early on. A lot of startups don’t give themselves enough time and runway to fail, so they never do find that coveted product-market fit. As Shipper has observed, this outcome usually coincides with the belief that successful companies should see consistent, promising growth. But in his experience, startups go through long plateaus punctuated by a step change in growth. You have to wait for the step change. In evolutionary biology, there’s a theory called punctuated equilibrium, the idea that species evolve almost imperceptibly for thousands if not millions of years, and then suddenly massive changes occur when there is a global catastrophe or the environment shifts radically. Suddenly, the rate of evolutionary change spikes. In the case of Firefly, Shipper and Meltzer had a bunch of game-changing deals in the hopper for quite some time, with no clear sense of whether any would close. “If you’re trying to sell to larger organizations, they have a lot of priorities, a lot of people involved. You basically have to wait for the stars to align to get a green light on your product. Deals require very, very long leads," Shipper says. “We’d have a full pipeline, but then one company would say they were going to push the deal back a quarter, others would just drop off, sometimes without us knowing why. In most cases, it was clear that larger businesses were hesitant to work with a startup, so they’d want to see how long they could keep us around, and how consistent we’d be in our service. The only thing to do was stick around and try to get people aligned around using this new technology.” Eventually Firefly’s pipeline started to produce. This isn’t to say that every startup should hang on to the very last straw. You simply don’t want to quit too early. “The best thing to do is nail down why things are not going well. Is it really clear that no one wants to buy what you’re selling because they don’t have the problems you’re trying to solve? Or is there evidence that your product could be useful eventually with enough feedback and traction?” You have to be brutally honest when you answer these questions, Shipper says. A lot of times things could improve if you only gave yourself more time and tried more things. The Firefly team had a very different approach in mind — one that ended up paying off in big ways. Shipper and Meltzer started pitching customers who already had live customer service chat widgets that would pop up on their sites to help current visitors. They figured that being able to share a browser screen would be even better for companies to provide a higher level of service. They made a big list of those companies and emailed them to see if they were interested in what Firefly could do. Even though Firefly was still a work in progress at the time, Shipper and Meltzer were able to convert some of these early customers. They made it clear to the people they were talking to that they were specifically trying to improve their lives and jobs, and made them feel like they had a stake in the result. Of course the tactic of selling from the beginning only works if you’re prepared to immediately funnel the feedback you get into product development. Shipper and Meltzer made it a high priority to capture all of the data they gleaned from email replies and conversations to enter it into a feedback loop that yielded real, noticeable changes in how Firefly operated as software and a company. When asked how they managed to evolve both their product and sales process at the same time with a tiny team, Shipper says that it was critical for everyone involved to both understand the business and be able to ship code. This might sound like trying to build your own herd of unicorns, but it vastly accelerated their ability to land customers and deliver something to them on time. “Not only could everyone involved understand what was going on, but it was just easier to keep everyone in the know and on the same schedule. We’d all focus on sales during business hours and then switch to programming at night.” At an early stage, this is feasible. Notably, Shipper says, not all of the feedback they got through selling was about improving the product. A lot of what they learned improved their approach to sales too. “We had this initial idea of going to companies that used live chat customer service systems, but in doing so we realized how small most of them were. It occurred to us that we could sign up all of them individually and probably still not make that much. It was only after talking to them that we decided to go straight to the chat companies themselves that sell to the smaller businesses. They were bigger, making more money, looking for a competitive edge.” In their research, the Firefly team had discovered that the customer service chat sector was deeply fragmented, with upwards of 60 companies offering nearly identical products. In this environment, Firefly’s co-browsing capabilities would be a huge differentiator. Shipper knows this on a personal level, having fielded some outrageous offers to drop out of school and join other companies. He steered Firefly the same way he steered his personal life — keeping things simple until he had all the information in hand and a clear idea of what he wanted. “The prevailing wisdom is that you should raise more money than you think you need, and I agree that’s probably true,” Shipper says. “It’s just that it should only happen when you’re confident in the fact that more money will allow you to grow much faster — when you’ve already found your trajectory and you just need to accelerate it. This isn’t always the case.” Until you feel this confidence, you should be building with as little money as possible. “Honestly, most products that get huge amounts of early funding could be built for something like $50,000," he says. All of this combined made Firefly an attractive acquisition target, Shipper says. By selling from the beginning and not being deterred by initial failure, their product gained so much momentum that customer support organizations were starting to demand co-browsing functionality.